Our commitment to diversity and inclusion ensures that all are welcomed without regard to age, religion gender, ethnicity, national origin, sexual orientation, gender identity or expression, marital status or domestic partner relationship, physical characteristics or disability. Diversity and inclusion are core values at Dykema. Fostering diversity and inclusion brings not only an enriched work environment, but also is key to providing the most sophisticated response to our clients most complex business needs. We continue to develop, implement and monitor programs and activities that not only enhance diversity and inclusion, but eliminate any obstacles to those initiatives. Dykema’s Diversity and Inclusion Board is comprised of an Executive Committee and the Recruiting, Retention and Diversity Initiatives sub-committees to more effectively underscore the Firm’s commitment to recruit, retain and promote lawyers from diverse backgrounds. Our Board members have diverse backgrounds from various offices, who oversee and actively manage the firm’s diversity program. This includes some of the Firm’s most senior contributors, including our Chairman/CEO of the Firm and other executive management members. Dykema’s attorneys are active contributors, members, speakers and supporters of many diversity related organizations, conferences, job fairs and scholarships. Dykema has been a long-time sponsor of local high-school urban work study programs. We sponsor students from the Cristo Rey and Christ the King Corporate Work Study, the Genesys Works, Grow Detroit’s Youth Talent and the Loyola Work Experience programs. Dykema participates in the Wolverine Bar Association’s summer clerkship program, through which we hire a diverse law student after his/her first year of law school. Dykema has also created an informal clerkship program with the Indigenous Law Program of the Michigan State University (MSU) College of Law. Through this program, Dykema has committed to maintain a clerkship in its Lansing office for Native American students who are members of MSU’s Indigenous Law Program. Dykema has established annual diversity scholarships for law students at the University of Michigan, launched in 2005, and the University of Illinois, launched in 2006. This award, designed not only to promote diversity in the legal profession but to encourage outstanding law school students to remain in their respective geographic markets upon graduation, is a $7500 per year gift, to be applied toward tuition and fees in the second and third years of law school. We offer recipients of the scholarship the opportunity to join Dykema for the summer following their first year of law school. As part of Dykema’s continued commitment to diversity and inclusion, our women professionals have organized the Dykema Women’s Business Initiative. This initiative brings together business women and leaders from diverse occupations, providing opportunities for building leadership skills, networking and professional and personal growth. We mentor our women professionals in leadership, professional and business development through individual partner/associate mentoring relationships and group activities. We promote business networking relationships within and outside the Firm and pursue business development opportunities and business channels unique to women. Dykema PRIDE is a resource for employees who identify as LGBT and allies. The group works to provide education, cultivate business and talent development, while also positively affecting firm culture, firm retention, and recruitment goals. 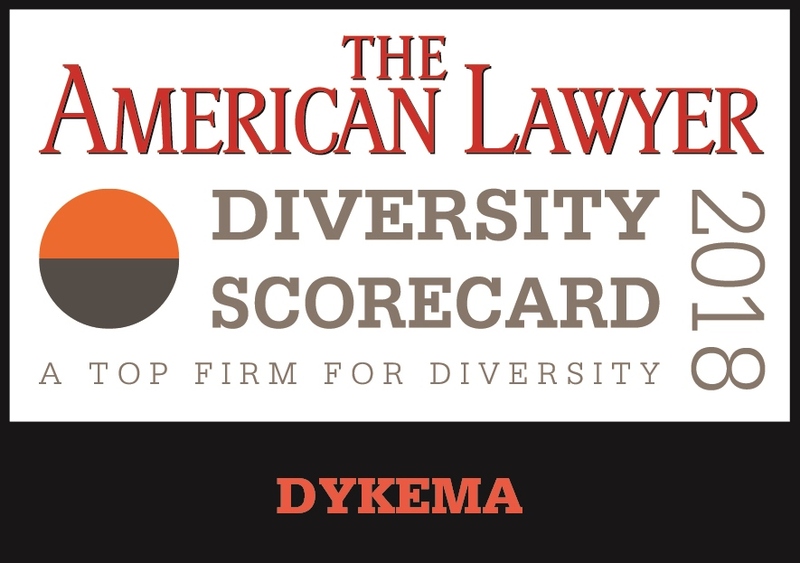 The American Lawyer's "Diversity Scorecard"
In 2018, Dykema was recognized as a top U.S. firm for diversity in The American Lawyer’s annual “Diversity Scorecard” report. With a Diversity Score of 25.9, Dykema ranked 96th out of all Am Law 200 and National Law Journal 250 law firms, up 21 spots from the firm’s previous ranking. Dykema ranked as a Top 10 U.S. firm in Law360’s “The Best Firms For Minority Attorneys” report. Dykema was listed as the eighth-best U.S. firm in the 300-599 lawyer category based on the racial and ethnic minority diversity of its attorneys. For the past five years, Dykema has earned a top score of 100 percent in the Human Rights Campaign’s Corporate Equality Index, a national benchmarking survey and report on corporate policies and practices toward lesbian, gay, bisexual and transgender employees. Dykema was named to MultiCultural Law magazine’s list of “Top 100 Law Firms for Diversity” for six consecutive years.